A “secretive”, pro-Israel, bullying, racist Jewish billionaire exercising a nefarious influence on the American political process. His name is Sheldon Adelson, and, in nearly 3000 words in two separate Guardian reports (both published on Jan. 28,), Paul Harris and Arun Kundnani have played to their Guardian base with the unmistakable evocation of the injurious effects of (Zionist) Jewish money on the American body politic. Harris’s “The Secrets of the billionaire bankrolling Gingrich’s shot at the White House“, warning of a Jewish billionaire attempting to purchase the outcome of the U.S. elections, contains tropes similarly found in Arun’s piece, but Arun‘s account of Adelson, in “Newt Gingrich’s agenda-setting big donor“, represents a far more egregious polemical assault on pro-Israel American Jewry. Arun begins his critique of Adleson’s substantial donations to the Gingrich campaign by attempting to explain his motives, complaining that the New York Times and others in the MSM have been less than direct, and even coy, about Adelsons’ political views. [The NYT] ignored the fact that the Adelson [family] uses their wealth to fund rightwing groups in Israel and anti-Muslim campaigns within the U.S.
Adelson is a friend of Israeli Prime Minister Netanyahu… [and] has also funded the leading pro-Israel lobby group, the American Israel Public Affairs Committee (AIPAC)…known for its strong and effective advocacy of Israel’s interests. Arun’s caricature of Adelson couldn’t be clearer: A wealthy American Jew attempting to manipulate the U.S. political system to promote not American but, rather, Israel’s interests. [Adelson] also reportedly supports the Clarion Fund, which produces scare-mongering films advancing the conspiracy theory that Muslims seek to impose sharia law in America. One of the Clarion Fund’s films, “Obsession“, which I’ve seen, at odds with Arun’s characterization, does not contain anti-Muslim racism, and certainly does not trade in conspiracy theories. The film opens with a very clear explanation that their focus is not on the overwhelming majority of Muslims in the world, but merely on Islamists who espouse radical and violent views. Indeed, the video largely consists of clips of Islamists on Arab TV (in their own words) advancing hate and inciting their followers to launch a global Jihad. The suggestion there’s something bigoted about warning of the very real threats posed by radical Islam is one of the moral signatures of the Guardian Left – those who genuinely seem more concerned with the “agenda” of Zionist Jews than with proponents of a reactionary, violent, and theocratic movement inherently at odds with progressive values. Right out of the Guardian commentary playbook, Arun sows doubt on the morally intuitive understanding that Israel is indeed a bastion of liberal democratic values and human rights in a region awash in repression and religious totalitarianism. Is it even debatable that the “human rights of Palestinians” continue to be abrogated by their decidedly reactionary Islamist leaders in Gaza? What possible defense could Arun mount to evidence that the rights of women, gays, political dissidents and religious minorities are routinely violated in the Palestinian Territories? Interestingly, Arun, a Soros fellow, has appeared at events about Islamophobia sponsored by the Islamic Human Rights Commission (IHRC). [The IHRC] campaigns for imprisoned extremists such as the “Blind Sheikh”, Omar Abdel Rahman, currently serving a life sentence in the US for his part in the first blowing-up of the World Trade Centre in 1993. The IHRC’s chairman, Massoud Shadjareh criticised the prosecution of Abu Hamza in 2006, claiming that the conviction created “an environment that can only further alienate the Muslim community”. Shadjareh has called Zionism a racist ideology, and, in a 2006 demonstration in London, called for support for Hezbollah. The IHRC also organises the annual al-Quds day parade in London – an event instituted by that well-known champion of human rights, Ayatollah Khomeini. 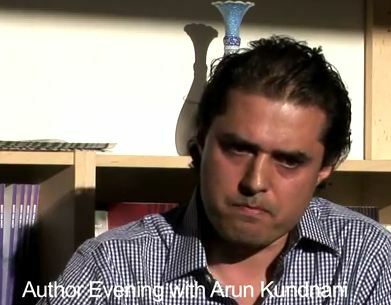 Arun also appeared in 2006 UK forum titled “Racism, Liberty and the war on terror”, whose co-panelists included a who’s who of Islamists and their supporters, including Moazzam Begg, former Taliban supporter and al-Qaeda member, and Salma Yaqoob, the former vice-chair, of the Respect Party who described the 7/7 terror attacks as reprisal attacks against American aggression. Arun is an editor at the journal, ‘Race and Class’, which frequently publishes essays by those opposed to Israel’s existence, including one by Hilary and Steven Rose which championed the virtues of a complete cultural and academic boycott of Israel. Arun has also, in an interview, spoken favorably of Islamist thinkers like Hassan al-Banna (founder of the Muslim Brotherhood), Tariq Ramadan (a proponent of Islamism who happens to be the grandson of al-Banna) and Sayyid Qutb (the Islamist writer who’s been credited with inspiring the ideology of Islamist groups like al-Qaeda). Moreover, in the Marxist-inspired, ideological spirit of Guardian Associate Editor Seumas Milne, Arun has derided the West’s war against Islamist terrorism as nothing more than another form of “neo-colonialism“. Arun here is marveling, indeed celebrating, the American lurch towards the mainstreaming of classic antisemitic tropes; seeing its resurgence as a hopeful, indeed progressive, indicator of the changing political climate: The fear of American Jews loyal not to their own country, but to a “greater Israel”. Arun is speaking truth to power, bucking the politically fashionable concerns of a resurgent antisemitism. But, perhaps Arun’s greatest conceit, and most deceitful narrative, involves the suggestion that antisemitism “continues to be central to much far-right ideology in the US and Europe”. Is there really anyone who’s intellectually and morally serious who believes that Judeophobia is an ideological vice primarily found on the right? Can anyone aware of the malign, often annihilationist, anti-Jewish rhetoric emanating from the Middle East – in their media, popular culture, and during sermons delivered in mosques located in Cairo, Damascus, Riyadh, Gaza City, and Ramallah – honestly suggest that the the most serious, pervasive and endemic antisemitism in our day lay not in the Islamic world? Arun’s profound moral obfuscation about Islam’s Jewish problem, couched in an essay itself laden with classic Judeophobic tropes regarding the corrosive effects of Jews’ money, represents a supremely cynical moral inversion. Yet, Arun’s polemical assault on the motives and loyalties of American Jews represents the kind of bigoted propaganda continually, and audaciously, couched in progressive terms at the ideological space known as the Guardian Left. derives from Tom Friedman’s article in the NYT. Friedman has proven once again that there is no more useful idiot in the service of a cause devoted to his own destruction than a Jewish useful idiot. I don’t know, I think Indians (Hindus) can also give you a good run for your money, Akus. You may be right – I really don’t know if there are any useful Hindi idiots. But there are undoubtedly hundreds of millions of Hindus, and a useful idiot or two will not cause them to face obliteration. However, the 6 million or so Jews in Israel are faced with daily calls for just that fate from Iran, Gaza, and Lebanon (and, now, the “freedom-loving moderate Islamic democrats” in Cairo) so a Jewish useful idiot is far more dangerous to his or her own people. Is that all you can come up with as a response? Name calling? Could it be that’s all you have left as a defense? Every time I read these types of articles about money and US politics, be it’s influence on domestic or foreign policy, for better or worse, perceived or actual I have only one position. “Talk to the hand, cause the face don’t want to hear it” The Supreme Court of the US has ruled that money is speech. Note also that Adelson is described as “secretive”. He may be but enough seems to be known about him and what he is up to. See http://www.newyorker.com/reporting/2008/06/30/080630fa_fact_bruck. So it looks as if the G regards these as pretty extreme and unacceptable views – though they seem pretty minimally-demanding to me. Israel first. Right or wrong. Perhaps you prefer al qada first. Right or wrong. Andy Happy Nakba to you and yours! Well there you go. I wouldn’t dream of saying Happy H… to you. Antisemitism is an attitude and you just demonstrated it. Shame on you. No, Adelson is hitting the papers for having given five million bucks, through his wife to a Republican politician he’s supported for years, who has an only marginal chance of winning the Republican nomination, and none of winning the presidency. Adelson might as well have thrown it down a well, and I wish he’d given it to Birthright, but it’s his money. The worst part is that Gingrich, that miserable idiot, fueled this little feeding frenzy by saying “He supports me because I love Israel”, probably because “He supports me because I support wealthy businessmen” didn’t sound grand enough. They simply have no shame spreading this kind of vile, prejudiced, demagogic claptrap. Regarding Kardani, it once again raises the question in my mind as to why we see Indian academics and journalists so fascinated with tiny Israel, which seems to loom so large in their global concerns. After all, the whole population of Israel is a fraction of the population of one of India’s large cities.